Titanium Sponge for Aerospace & Defense Market size is estimated to surpass USD 1.94 billion by 2024; according to a new research report by Global Market Insights, Inc.
Increasing material requirement with high tensile strength, low weight, and high corrosion resistance for enhanced durability and performance of the aircrafts will propel the industry growth. Augmented emphasis on improving the performance of commercial and military aircrafts through reducing the overall aircraft weight and enhancing the fuel efficiency was the major factor influencing the Ti metal demand. Utilization of components made from these material alloys in doorframes, fuselage frame, floor beam, seat rails, turbines, engine mounts, and other such components is expected to surge product adoption. High-grade titanium sponge for aerospace & defense market segment is expected to retain its largest penetration share over the coming years. This can be primarily attributed to the requirement of high concentration levels of titanium to provide quality performance and least brittleness for aerospace applications. Easy availability of alternatives in the form of scrap at relatively low prices are expected to pose considerable challenge to the industry growth. However, this will remain largely dependent on the quality of scrap materials available for recycling applications. Moreover, requirement of light weight and high tensile strength metals for applications in naval ships, helicopters, armor plating & missile, landing gear and fire walls will provide lucrative growth opportunities in the coming years. 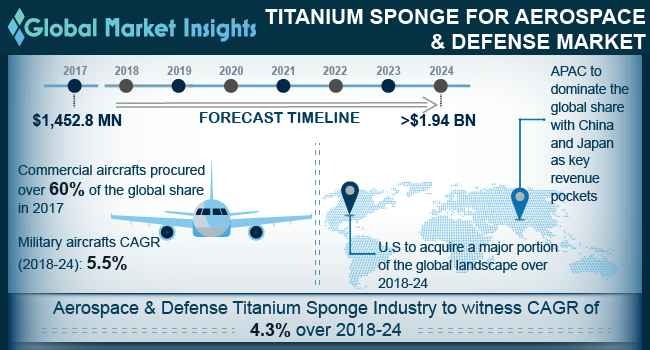 Commercial aircraft dominated the global titanium sponge market demand in 2017 accounting for around 60% of the industry size, is expected to retain its dominance over the forecast period. Airbus & Boeing contribute a significant share of the overall commercial aviation market share and are among the major Ti metal consumers. Growing number of deliveries and backlogs are expected to provide consistent demand through the forecast period. Military aircrafts are expected to witness highest growth over the forecast period for its extensive applications in surveillance, reconnaissance, aerial warfare, and provide supplies to distant locations for military operations. The segment will witness over 5.5% CAGR up to 2024. Moreover, increased emphasis on the design for efficient operations will in turn influence increased utilization of titanium sponge in military aircrafts, specifically in the airframes. Asia Pacific is expected to retain its dominant in titanium sponge for aerospace & defense market share. Its largest contribution to the global industry is due to the presence of largest production base in China and Japan. These two countries also contribute a significant share of the global Ti foam exports. According to U.S. Geological Survey import sources, Japan contributed to 78% of the total imports in the country over the duration of 2013 to 2016. Some of the major industry participants in the global market include Tangshan Tianhe, Zunyi, ZTMC, Shuangrui Wanji, VSMPO AVISMA, Solikamsk, OSAKA, UKTMP JSC, The Kerala Minerals & Metals Ltd., Toho Titanium, and Timet. Industry presence is dominated by the few players contributing significant share of the global market. Industry participants in China, Russia, and Japan contribute to over 80% of the global Ti foam production share. Moreover, India is only the seventh country across the globe that has initiated the production of Ti foam. High initial capital required for the setting up of manufacturing plants is expected to remain the prominent restrain for new entrants.